Today's all indoors (6deg F plus windchill) so I'll be puttering in the shop and feeding the wood stove. I've been working on the rear wheel of my winter project: '68 Raleigh GP. Finally got the FW body off (about a month of penetrating oil and heat - then clamped the body in the vice). Started to true the wheel but found it was 6mm offset to the NDS. Ah, yes the paint rubbed off the NDS chain stay. OK, no worries I've re-dished wheels before. turn, turn, squeak squeak, turn, turn - gee these DS spokes sure are tight - ping, stripped the threads on one. Ugh. This don't feel right (trust your instincts). So I unloaded all the spokes and spun the rim. Sure enough there was a bend in the rim and I was cranking those spokes trying to straighten it. Not gonna happen. After a lot of study, a few clamps, a couple sections of 6x6, a length of 3x3 oak and a pipe clamp to mash on the bent section I'd straightened out the rim. BTW this is a 40 year old Sturmey-Archer chromed steel rim in very nice condition. I've not seen another one - in person nor on-line so its worth saving. Today I'll finish dishing and truing the wheel and get back to reassembly. Glad it's winter time so I'm in no hurry to finish, no compulsion to take shortcuts. 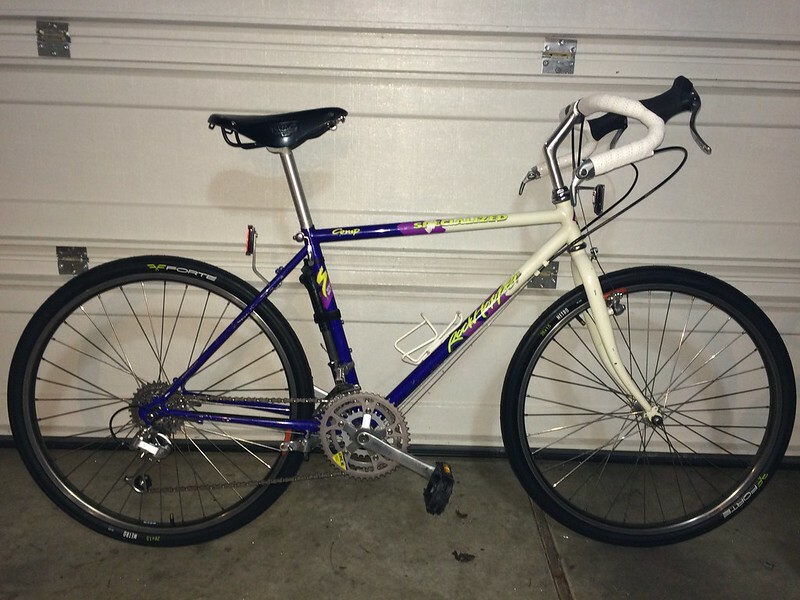 I'm upgrading my daughter-in-law's 1987 Centurion LeMans RS with a cassette wheel, shorter crank arms with better gearing, and new tape/housings for her training and our STP together this summer. 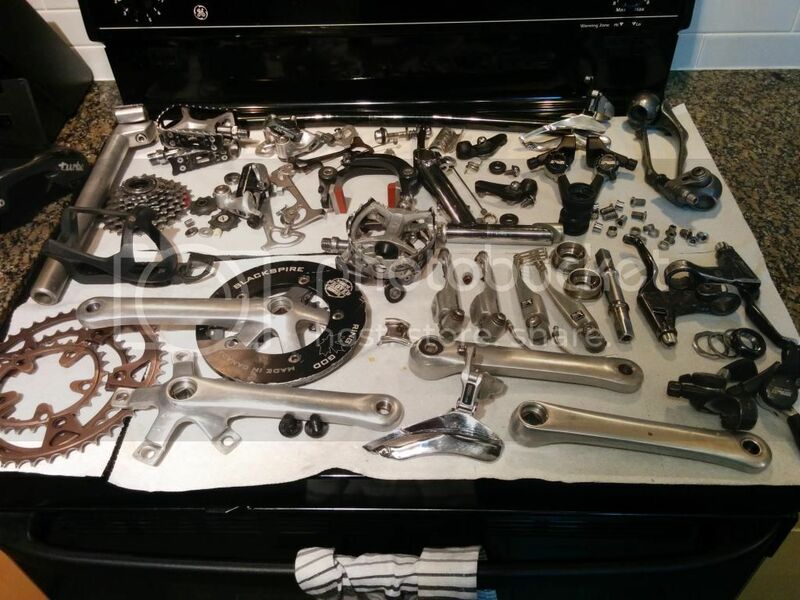 Just treated the frame insides with BoeShield as long as I had everything apart (fork needed a new crown race). Reassembly will start tonight. Shipping was $50.00 and it took one month to get them. Purchase date was 1/11/15. Today, specifically this evening, was dedicated to the Gazelle. Got a BB installed, fitted the SR crank I wanted to use, observed that the chainline wasn't good. Curious, since that BB came with the crank, I think. Or maybe not, whatever. Undid the BB, used a different spindle, re-installed the crank, installed pedals and chain. 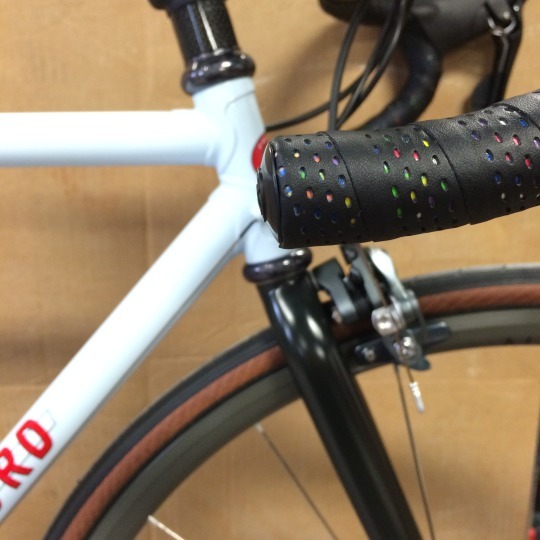 inserted seatpost. Now I just need a saddle and bottle cage. Need to install cables. Need for the snow to stop. Most of the upgrades and replacement parts are in place on the Cannondale CRITter and Trek 760 so really nothing more than fine tuning and that extra diddling around in the dead of winter. Preparing for a small swap meet in Chicago.............half table. 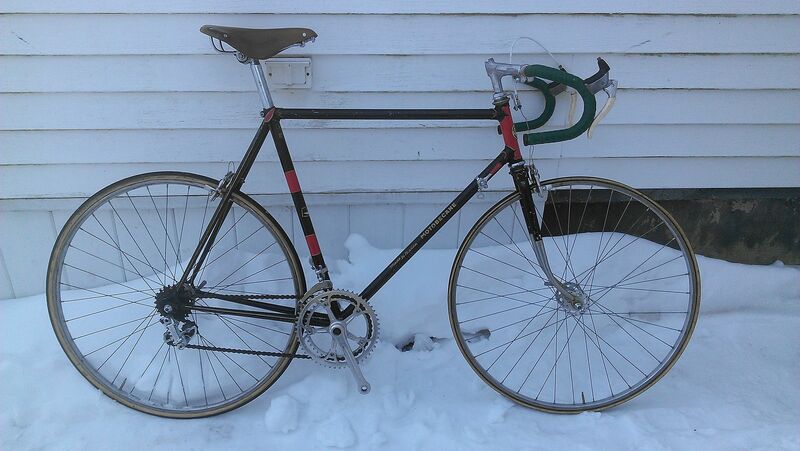 Also sold my recently aquired VAR truing stand via ebay this morning and shipped it. I've been making lots of room in the basement shop and planned some rearrangements this evening over a few cold ones. Installing the brakes and cables on The Peugeot That Waited 24 Years for Doug to Come Back. Test riding it on my town's steepest hills to see if the compact double (46/28) I've installed for him is going to make it in his neighborhood - which has even worse hills! Shifting is not too bad, considering the big jump between chainrings. Goal was to build it so it could make up his hills without completely junking the drivetrain. Just swapped in the smaller chainrings and shortened the chain is all. Sometimes it's best not over think these things, I guess. I even had a larger (14-28) Atom77 freewheel to replace the original (14-24) one. I did a complete teardown and cleaunup on the frame and parts and have been slowly putting it back together. 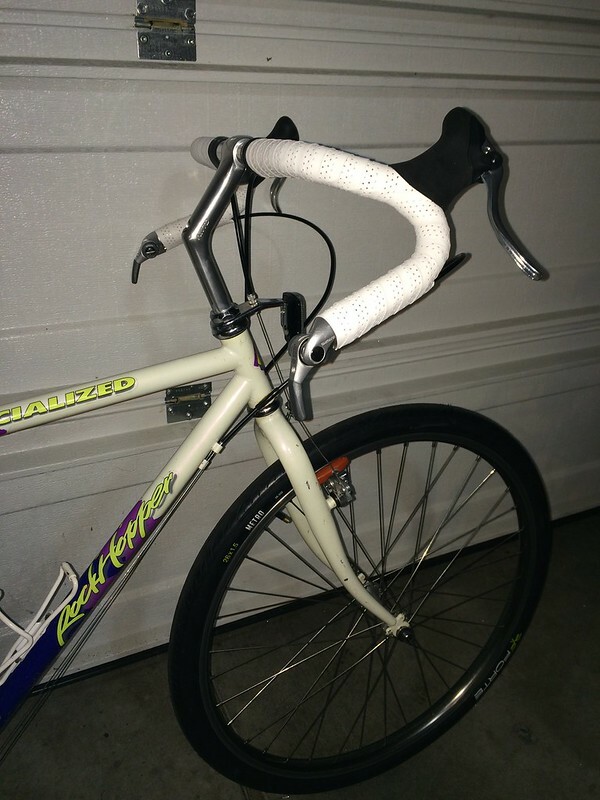 After exchanging a bunch of build-related emails, I'm gratified that Doug has decided to do the rest of the makeover (saddle, tires, bar tape) himself. He's getting kind of psyched about getting back on his old road bike. Also rode one of my favorite lunchtime loops on my Velo Cheapo, trying to rack up some more miles before the contest deadline. Last edited by Lascauxcaveman; 02-14-15 at 09:27 PM. My Gitane Interclub officially became a donor bike today, supplying normandy wheelset, suntour freewheel, chain, seatpost, brooks pro saddle, pivo stem and bars, mafac brakes and levers. The record drive train had to be purchased separately. Unfortunately my stronglight 93 didn't have enough clearance on this frame for the inner ring, although it did the Gitane. I just need a few doodads (campy cable guides etc) and this baby is ready to roll! I knew that those red campy shifter pods would come in handy. A pair of Challenge Paris Roubaix 27mm sew-ups are going to be stretched and glued this week. This bike is the perfect size for me and I foresee this being my stormbringer. Last edited by JJScaliger; 02-14-15 at 09:21 PM. 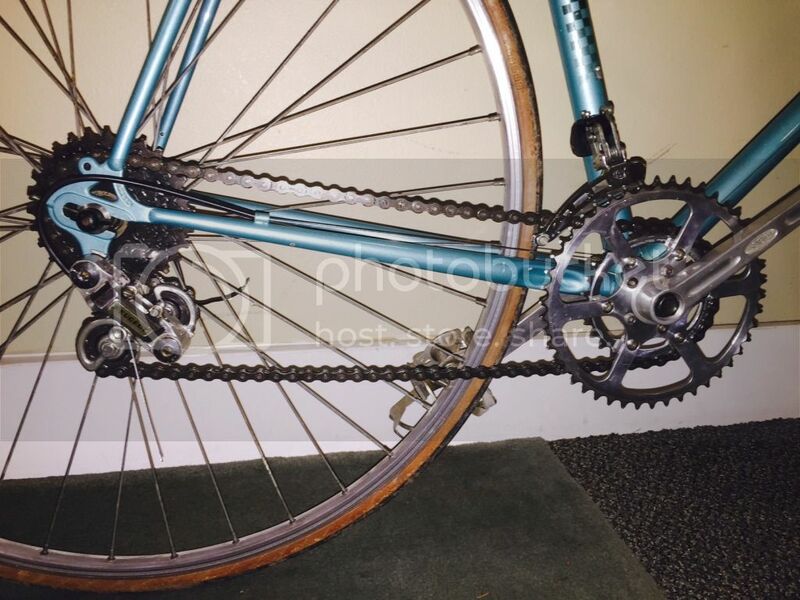 Bikes: 2016 Bianchi Infinito w/Chorus, 2011 Look 566 (deceased May 28, 2016), '04 Cannondale Optimo 800, '87 d'Arienzo-Basso w/full Campy & '51 Rudge Sports, '72 Raliegh Superbe. 1989 Black Lightning and '62 Raliegh Gran Sport (currently under restoration). Today I went to Bicycle Museum of America in New Bremen, Ohio with my wife and son. I know a romantic day trip on Valentine's Day! I am such a great husband. Well my wife really enjoyed the museum! Still a very nice place to see bikes from Draisines to the most recent rides available. Some restored and some in original condition. Got a special treat as we were the only customers today, a private visit to the basement stash of bicycles! The weather was pretty ridiculous in the area getting there. If you can get there, very much worth the measly $3 admission cost. I ironed on reflective tape to my mittens, in arrow patterns so when I hold up my hand to the side, I am making a turn signal. I am sanding the paint on the frame I'm painting, in preparation for the next coat. 25 degrees with 20 knot winds today so surfing the interwebs and putting my Moser back together that I stripped down to clean, lube, touch up paint. I somehow came up two ball bearings short on the hub overhaul, so also waiting on some new bearings to come in the post. Today we worked at staying in shape for when the roads are actually visible again. In New Hampshire's White Mountains. -5F when we came off the trail, with a 25 to 35mph wind. In other words, brutally cold. I took the Nitto Dirt Drop stem & Portola handlebars off the 16.5" Trek 820 and put the original bars/shifters/brakes onto the 820. Am offering to give it to my sister-in-law. It's a 1995, not lugged, although the two tone paint job is pristine. If she doesn't want it I'll post on CL. Made an appt. with a buyer to sell the Violet Schwinn Le Tour II mixte for tomorrow. Took the Midge bars off the 1988 Rockhopper and installed the Nitto Dirt Drop stem & Portola handlebars, with white handlebar tape to match the white front of the bike. Someone on the vintage mountain bike drop bar conversion thread had a pristine looking '89 Rockhopper with the same colors as mine and they had that setup so I basically copied the look. My Rockhopper has lots of paint chips all over though. Oh well. Also installed a black B17 onto this bike. 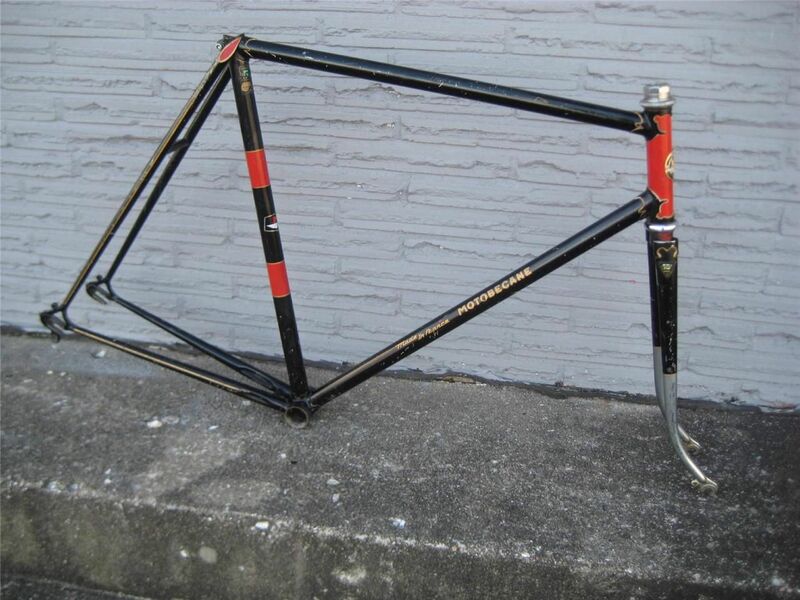 I have a 1990 Trek 930 black, lugged Singletrack and I'm thinking to install the black SR Stem & Black Midge bars on it as #2 drop bar conversion. It's a really nice ride. It's also a 7 speed, all original with SunTour gruppo, and I've got SunTour indexed 7 speed "Bar-Cons" - the all black ones I'd use. It could be my black stealthy bike. Rims are dark too. Thoughts? I cleaned some early XT parts with a couple LX inclusions (from a 1996 rockhopper) from my 1987 Mongoose Pro. A wire wheel on my drill works wonders on tough grease and especially chainrings. I was enjoying the wonderful California weather. Painted exterior of house, while keeping close tabs on my ebay auctions. Then from 1 to 4 I had an open house on a river bluff property I'm selling. Had some people viewing the property, when I had to excuse myself to secure the final bid on my c-record pedal set. Then when I got home I painted a couple more hours, came in at 6:15 when it was dark and trued my pro-class rims on my early 80's mongoose atb. It currently has haro bars on it but I'm tempted to try some drop bars and a brooks seat. My wife calls this one my "bum" bike. After sanding, I put another coat of paint on my 1974 Raleigh International. This project is taking years, literally. I'm not sure I want to paint another frame, but I think I am getting the hang of it. If I like the results, I might be open to doing it again.